No real model workshop is complete without a classic Dremel Table Saw. I own several with with modifications. 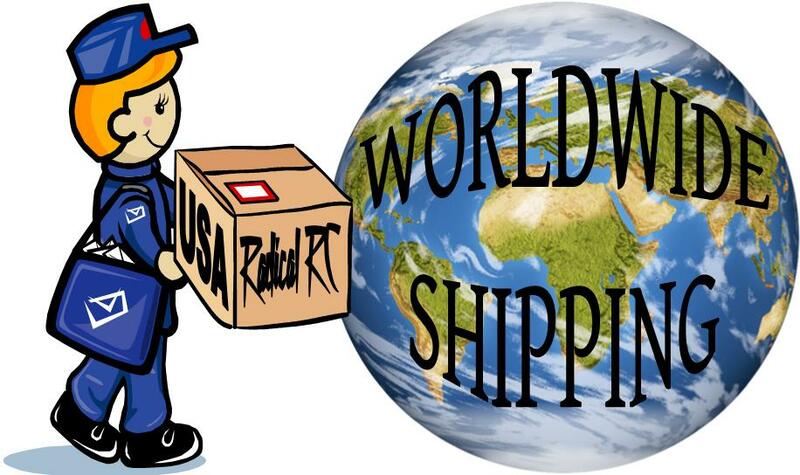 In this category you'll find those mods as I finish the products and make them available. The Dremel 580 & 588 (588 is 220v) are the best tablesaws ever made for model construction. 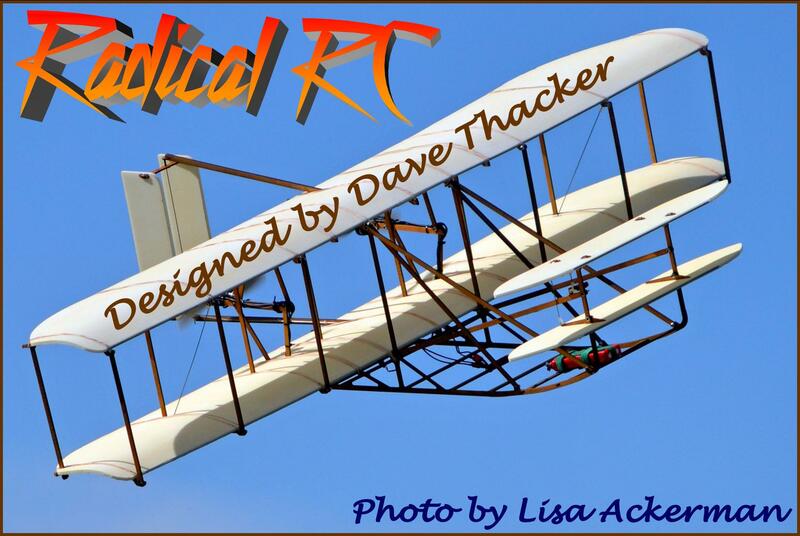 All parts, modificatioons, jigs and fixtures in this section will work with the Dremel Model 580, 580-2, 588, 588-2, Craftsman Model 572-2474 and Montgomery Ward Power Kraft Model TDR97501. Our heavy duty belt is is tougher and runs smoother than the stock belt. Over 50% thicker at .031". Miter gauge project is now complete. Made in our shop with various methods including additive manufacturing and laser cutting. Runner has greater precision than the original part. 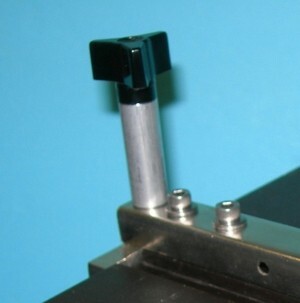 Includes clamping handle riser and quality knob far superior to original part. 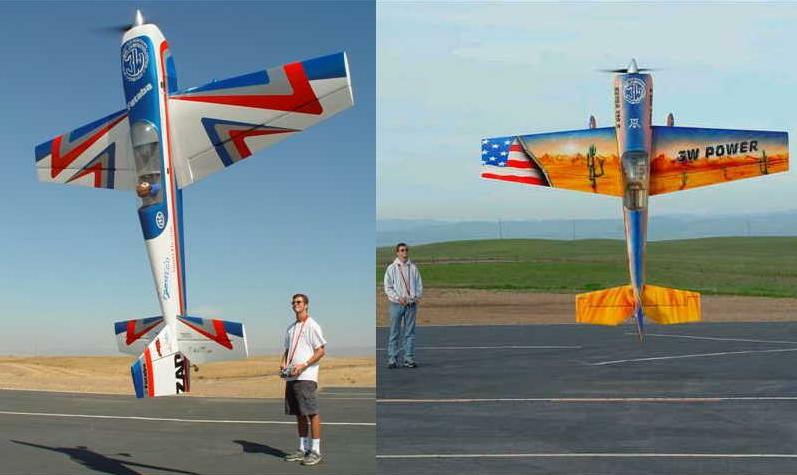 Plastic is tough ABS, runner is aircraft ply. Saw not included. 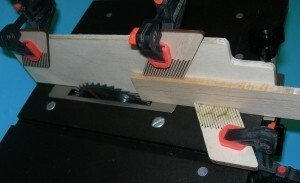 This item is one miter gauge as shown on top of sample saw. 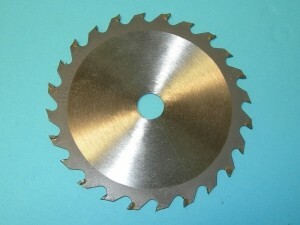 1/16" wide cut off disk with 5/8" bore. Be sure to purchase a 5/8" bore to 1/2" arbor adapter in order mount this item properly. 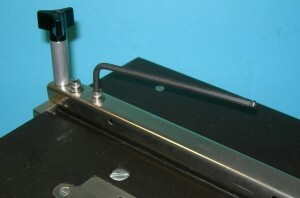 Allows you to cut aluminum, brass, steel and other metals on your table saw. Precision adapter collar fits over shaft allowing centering of 5/8" bore blades and cut off wheels. Acceptable solution at lower cost than our special adapter nut. Replacement blade securing nut with Dremel thread. Same nut as Montgomery and Craftsman labeled saws made by Dremel. 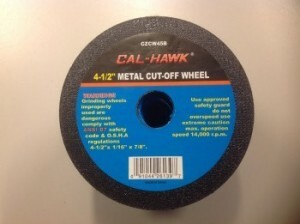 Specially machined nut allows use of cut-off wheels and saw blades with 5/8" bore. Proper thread for all 4" table saws made by Dremel including those sold under Craftsman and Montgomery Wards brand names. 24 tooth carbide blade. Throw away your steel blade! Our carbide blade cuts with 1/2 the effort of your sad old steel one. It's the quickest way to double your saws cutting power. Made by a famous Japanese manufacturer. The blade is not cheap but a real Jewel. 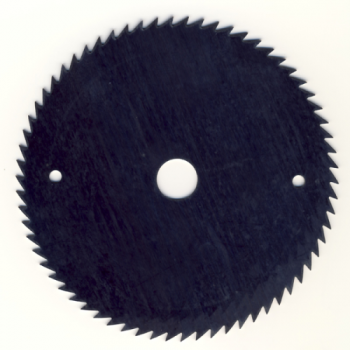 This is a 66 tooth 4 inch diameter high carbon steel circular saw blade, made in the USA. The blade has a rim thickness of approximately 0.045 inch (1.14 mm), plate thickness of 0.032 inch (0.81 mm) and a 1/2 inch arbor (hole). 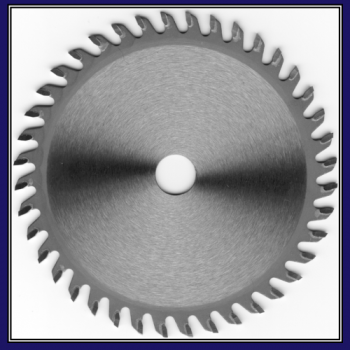 This blade can also be used in applications that require a 4 inch blade with 3/8 inch arbor. A 1/2 inch to 3/8 inch bushing for this will be included at no additional charge, if requested with your payment. This blade is designed to cut soft and hard wood, but not metal. It is a close replacement for the original Dremel combination blade No. 8003. Please follow all safety instructions that come with the blade and the safety instructions that were provided by the saw manufacturer. 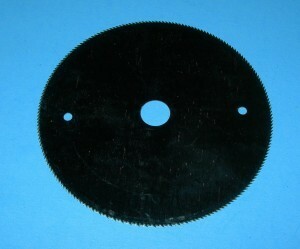 This is a 200 tooth fine 4 inch diameter thin precision finish high carbon steel circular saw blade, made in the USA. The blade has a rim thickness of approximately 0.027 inch (0.69 mm), plate thickness of 0.015 inch (0.38 mm) and a 1/2 inch arbor (hole). This blade is designed to cut soft and hard wood, plastic and non-ferrous metals (copper, zinc, brass, lead and aluminum). It is the best choice for cutting strips of wood because of the fine finish and minimal material wastage. It is a close replacement for the original Dremel fine blade No. 8004. This ultra narrow kerf blade MUST BE INSTALLED BETWEEN SUPPORT DISCS (not included) to control flex and provide adequate mount support and total thickness for the nut to seat correctly. If your saw does not already have them, you will need two precision support discs (not included in this listing). Please follow all safety instructions that come with the blade and the safety instructions that were provided by the saw manufacturer. This is a set of two 2.5 inch diameter precision support discs with 1/2 inch arbor (hole), made in the USA, for narrow kerf (thin) blades such as the 200 tooth blade. These thin blades must be installed between support discs to control flex and provide adequate mount support and total thickness for the nut to seat correctly. If your saw does not already have them, you will need this set of two precision support discs to use these blades. Please follow all safety instructions that were provided by the saw manufacturer. Pack of 2 each Socket Head (Allen wrench style), fits all Dremel Table Saws. Easily lost, get a couple of spares here. 2 per pack. 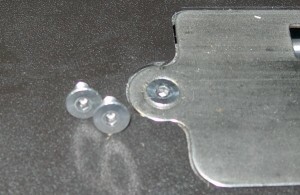 Pack of 2 each Slot Head (identical to factory screw), fits all Dremel Table Saws. Easily lost, get a couple of spares here. 2 per pack. 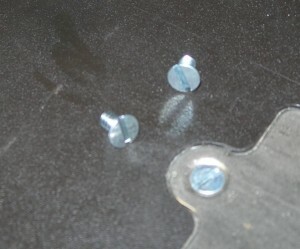 Stock screws are easily stripped and difficult to get tight enough to hold your fence in precision adjustment. This special self locking stainless replacement fastener kit will take and hold proper torque. The factory rip fence bracket is not threaded all the way through. It will be nessasary to run your 10-24 tap through the factory part to ready it for this conversion. All hardware required for conversion is included. 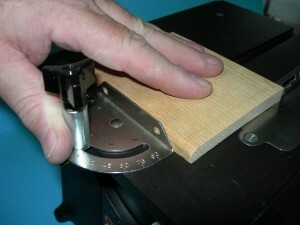 Allows the cutting of smaller work pieces. no fear of them being sucked into the kerf plate slot. For this item to work properly, your saw must be adjusted so the blade is parallel to the miter slots and in the center of that range. It's an easy quick adjustment and a real tune up that makes any saw cut much straighter. The stock knob is hard to get tight enough to securely lock the fence in place. Our knob can be tightened much more easily and raised up off the work surface so it's out of the way of material. Especially handy if your grip is not what it was when you were 20. All the hard to find hardware required for this conversion is included. The stock knob leaves a little to be desired. Our knob kit raises up the knob and makes it easier to use. Also the fence apparatus being larger makes it easier to grip and hold to the work-piece. All the hard to find hardware required for this conversion is included. Simple Auxilary Rip Fence is great for holding stock vertical. 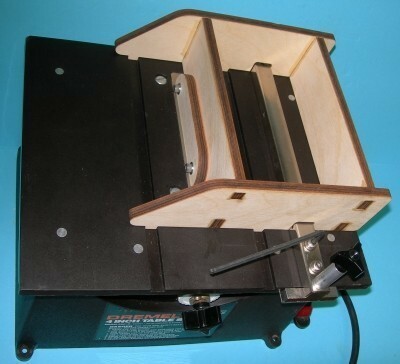 Perfect tool for making your own beveled strips such as aileron or trailing edge stock. Comes with handy thumb screws. May be mounted to either side of the fence. Install or remove quickly though we doubt you'll ever want to take it off. About 20 years ago, an old man took to the time to teach me table saw setup. It is truly amazing how little I knew at the time. Armed with his lesson, I was able to make all my saws cut straighter and my saw seemed to have quite a bit more power. Everything came out more square. AND! My work piece no longer tried to bind between the rip fence and saw blade or creep side to side while cross cutting. When the saw is running true, all it's power goes to cutting, not trying to overcome binding. 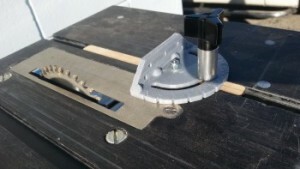 Our Dremel Table Saw Setup Jig Kit is only possible because of the modern marvel of laser cutting. Made to precise tolerances. It fits snugly into your miter gauge slots, you loosen the two large slot head saw squaring screws, loosing your miter adjustment on the face of the saw also. Raise the blade all the way up and clamp in our special fitting being sure nothing is binding. Re tighten everything. Adjust your miter indicator on the front for true 90 degree zero. 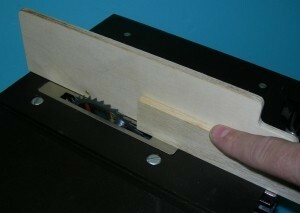 As a bonus, our jig also holds your rip fence perfectly square and parallel to the miter slots. Loosen and re tighten the rip fence screws and your done! A perfect true and straight cutting saw and you didn't have to measure anything! Assembly required. Simply press parts together flush and wick thin CA into the joinery. The only thing more important than a properly setup saw is calling your mother on her birthday. 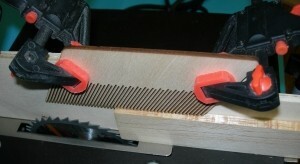 Micro Table Saw Feather Board 1/8"
A proper micro featherboard for your Dremel or other table saw. Clamp to your fence with light pressure against your work piece. Featherboard is an extra hand that helps hold your work firmly. 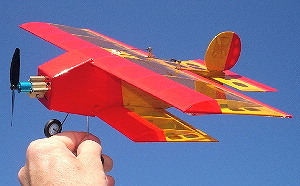 Package contains 2 featherboards. Micro Table Saw Feather Board 1/4"
Large Width Micro Table Saw Feather Board 1/8"
Large Width micro featherboard for your Dremel or other table saw. Clamp to your fence with light pressure against your work piece. Can be built into your own jigs for repetitive work. Featherboard is an extra hand that helps hold your work firmly. Package contains 2 featherboards. Large Width Micro Table Saw Feather Board 1/4"
Two Runners, 12" long. Use to build your own high quality jigs and fixtures. Precision laser cut parts. 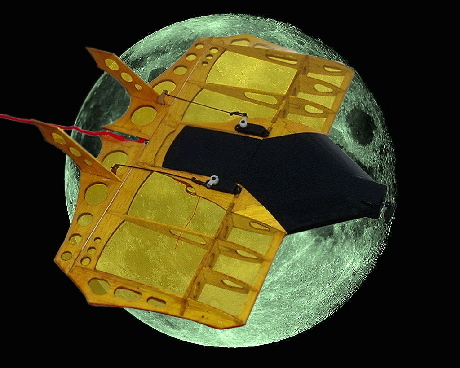 Each package includes 2 runners.